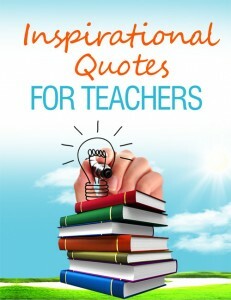 Get inspired, motivated and energized with this Inspirational Quotes For Teachers ebook. I’ve collected over a hundred quotes to keep you fired up about teaching. When you’re having “one of those days”, open up this ebook and get some inspiration. Our society is so caught up in winning, we forget that most of the great men and women in history have, at one time or another, failed at something. Often repeatedly, and discouragingly. But each failure is nothing more than a brick in the wall that forms the foundation of our success. We can’t forget that. Too often we get distracted by what is outside our control. You can’t do anything about yesterday. The door to the past has been shut and the key thrown away. You can do nothing about tomorrow. It is yet to come. However, tomorrow is in large part determined by what you do today. You have control over that. Fill out the form and instantly download this free resource.